The type of fat you use for cooking is important because not all fats are created equal, and some fats should not be heated at high temperatures. For example, extra-virgin olive oil loses its precious vitamin E and other phenolic compounds, which are a type of antioxidants, when heated. 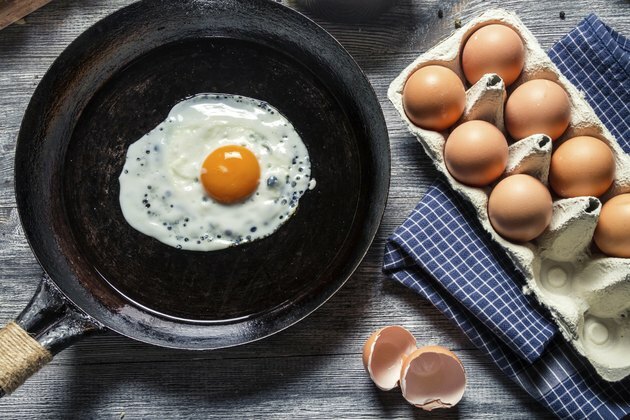 Choose fats that have a high smoke points for frying your eggs. Lard, regular olive oil and coconut oil are good examples of stable fats you can use for frying your eggs. Coconut oil is made from the fat found in the meat of coconut. Contrarily to most vegetable oils, coconut oil is rich in saturated fats. However, you should not worry about the saturated fats in coconut oil, because they are not associated with high blood cholesterol levels or heart diseases, as explained by Mary G. Enig, nutritionist and author of "Know Your Fats." The types of saturated fats found in coconut oil, called medium-chain triglycerides or MCTs, are similar to some fats found in breast milk. MCTs can contribute to a healthier body weight and a decreased risk of infection. The smoke point of coconut oil is relatively high, at 350 degrees Fahrenheit, which is the same as butter. Lard has a smoke point of 370 degrees, while regular olive oil has a smoke point of 420 degrees. Heating an oil above its smoke point can form compounds that can be harmful to your health. Never heat an oil at a temperature that burns an oil or generates smoke from the oil. You can safely use coconut oil in a frying pan to fry eggs, but keep the temperature moderate to prevent exceeding its smoke point. Coconut oil may be liquid or solid at room temperatures, depending on the temperature inside your home. The melting point of coconut oil is 76 degrees Fahrenheit, which means that it is solid below this temperature and liquid above it. To use coconut oil for cooking, add about a tablespoon, whether it is liquid or solid, to your frying pan. Heat your frying pan at moderate temperature to allow the coconut oil to melt -- if solid -- and heat the frying pan. Avoid heating the frying pan too much to prevent reaching the smoke point of coconut oil. Add your eggs and fry them as you would normally fry them with any other fats or oil. Choose virgin coconut oil over refined coconut oil for a more pleasant and mild coconut taste that goes well with eggs. Virgin coconut oil is extracted from the meat of coconut without the use of chemicals, unlike refined coconut oil. Try different brands of virgin coconut oil until you find the one you prefer, because the taste and flavor can differ depending on the type of coconut used. Use coconut oil to replace your usual cooking fats, whether it is to fry your eggs, saute vegetables or cook shrimp, chicken or meat.